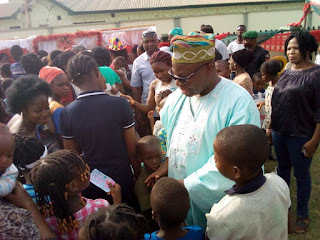 Dr. Akin Ogunbiyi, a chieftain of the People’s Democratic Party and founder of “Idera de Movement” in Osun State on Saturday sponsored a special Christmas party to celebrate and give children in the state tonnes of wonderful memories as the year winds up. Held at Sholly Party Outfits, adjacent foursquare church, Dada Estate, Osogbo, the state capital, the special party tagged, "Father Christmas Fun Fair" was sponsored by Dr. Ogunbiyi to interact with Osun children. The event was organised in conjunction with Rave FM, according to Ogunbiyi, a leading radio station in the state and Southwest, to bring the children together and interact with them, irrespective of their family background and status. Celebrating with the children, Ogunbiyi restated his commitment to the good and happiness of the people of Osun, especially the children. He prayed for the children, thanked their parents for being part of the event just as he prayed for Osun State at large and extolled the leadership of PDP in the state. The children were exposed to host of exciting activities and loads of fun. The event was spiced with educating tasks, and also provided unforgettable memories with new and intriguing games. It left the children with lasting smile and priceless look on their faces, a confirmation that they enjoyed their special day. Ogunbiyi wished the children and the entire people of the state, merry Christmas and happy new year in advance.